Looking to play better by jamming with a drummer? Designed for beginner-pro guitarists, QuickBeat is the next best thing to playing with a real drummer. Ask any pro, jamming with a drummer is one of the fastest ways to improve as a player. 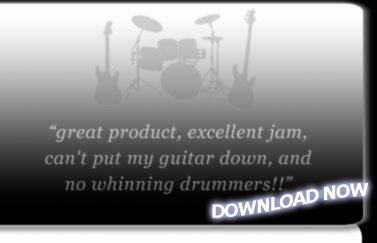 QuickBeat simulates playing with a real drummer, and you can download QuickBeat now. A fast way to be a better player. Most drum machines are expensive, complicated & frustrating. QuickBeat makes it easy for you to jam with the drums anytime you want. QuickBeat turns your computer into a drummer with over 100 beats in styles such as Rock, Country, Blues, Folk, Hip Hop, Metal, Funk, Latin, Reggae, Dance, Punk, and Jazz. QuickBeat costs less and is much easier to use than a regular drum machine. Easy & fun to use. Downloading QuickBeat is easy and designed for beginner Windows & Mac computer users. You'll receive the QuickBeat download immediately after payment. “Most useful program I ever bought." Gurantee - ClickBank will, at its option, replace or repair any defective product within 60 days from the date of purchase. Groove is what all the Great players have in common. It'll make you sound better than a new instrument. What's the price of groove?